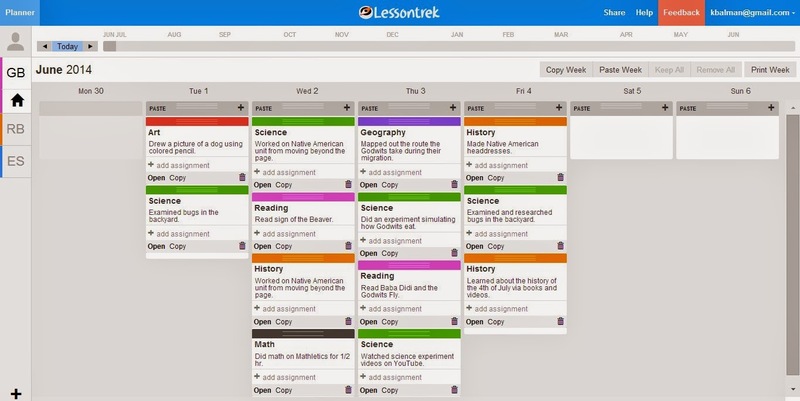 Lessontrek is an online lesson planner for homeschool parents and classroom teachers. This easy to use program was created by a team of designers, engineers, writers, teachers, homeschoolers, grandparents, project managers, and team players from all over the country. Though their backgrounds were diverse they all had one common goal, to develop a better online lesson planning program that met the needs of the modern day homeschool parent and classroom teacher. Each team member brought a unique view to the creation of Lessontrek. And in 2013 Lessontrek accomplished their goal and launched their amazing lesson planning program which offered easy lesson plans for all! If you read our blog often then you know that we unschool and therefore I don't do any lesson planning or give my children grades. With that being said I am required by the state of Georgia to keep records for 3 years of what the children learned. Up until now I have had a very hard time with lesson planning and record keeping because I have yet to find a program that fits our family's needs. I have tried paper planners, computer software programs, online programs, spiral notebooks, mobile apps....you name it I have probably tried it. I even tried creating my own customized form. So when I was contacted by Lessontrek to review their online lesson planning program I was a little apprehensive. First let me tell you about the Lessontrek features then I will tell you how I utilized the program for our unschooling family and if it worked! Lessontrek is still fairly new so they are continually adding to their program to make it even better. Based on user feedback Lessontrek has several additions in the works including gradebooks, shared subjects across students, attendance tracking (I am really looking forward to this) and transcripts. Lesson tracker - create detailed daily lesson plans for each subject. 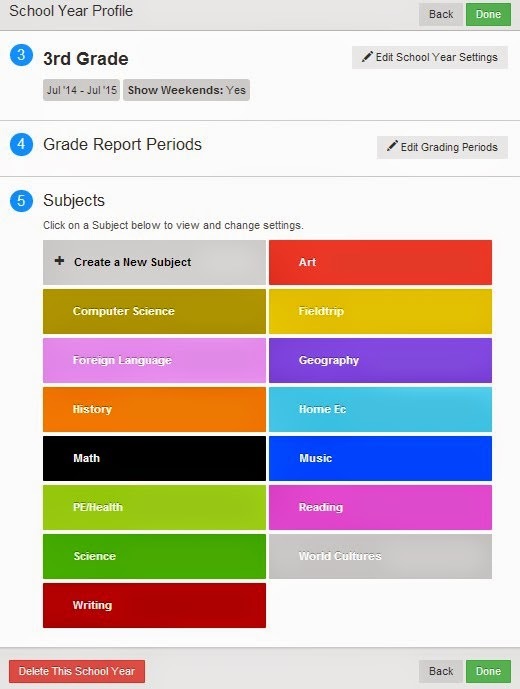 Grade recording - use the "assignment feature" to create individual assignments for subjects. You can also indicate grade settings and hour requirements for subjects. Drag and drop lessons to another weekday - easily move lessons to another day by dragging and dropping. Copy/paste individual daily lessons and weekly lessons - save time by using the copy/paste feature to easily recreate lessons across days or multiple weeks. Print weekly lesson plans - print weekly lessons for children to utilize or for record keeping purposes. This is what the printable version looks like. Secure information storage - secure years of records online safely and securely. Customer support - get quick customer support when needed. And provide feedback on features you like, don't like or would like to see added. Help feature - enable help feature to view info bubbles while learning to navigate Lessontrek. Example student - view the example student to easily learn how to use Lessontrek. The first thing I fell in love with was how easy it was to use. The program is really simple and doesn't over complicate the process of creating lessons and assignments. There is lots of flexibility so you can utilize the program with virtually every homeschool and classroom method. In just minutes you will have your children and lessons set up. Since we unschool I decided to use Lessontrek as a journal for recording what the children do each day. At the end of each day I simply add the subjects they covered along with a description of what they did for that subject. I even created a subject specifically for fieldtrips, since we do a lot of roadschooling. There is a very helpful "example student" which assists you in learning how use Lessontrek. After taking a few minutes to read over the "example student" lesson blocks I was ready to get started. First I created two student accounts. I simply clicked on the add student button and completed 2 simple steps. First I entered the child's name and chose a label color (I chose my children's favorite colors). Next I set up their grade level, school year dates and subjects. You can also set up grade report periods in this section too. I love that you can tailor the lesson planner to meet your needs by creating your own subject lists. 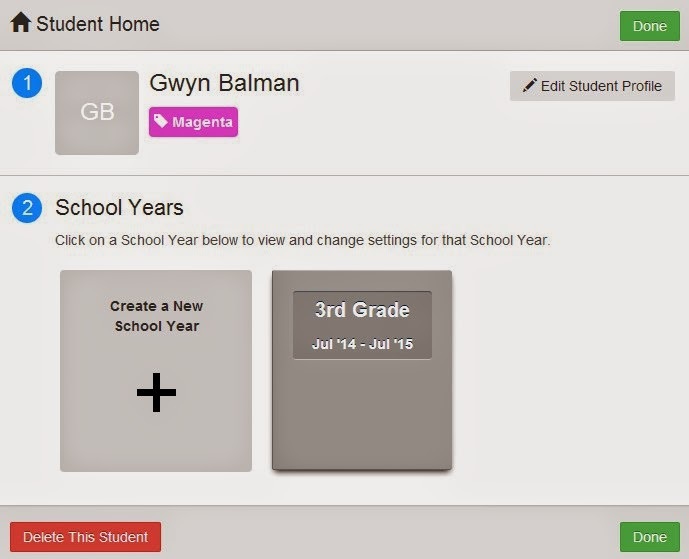 On the left side of the screen you can easily see and toggle between each student. To edit a students planner simply click on their name. To add lessons under each day click the little plus button at the top right corner of the lesson block. Then select a subject and add a description and assignment details if you wish. If you wish to copy a lesson to other days of the week just select the copy feature at the bottom of the lesson block. To copy an entire week select the copy week button, move to a different week and select paste. When you paste to another week you can select keep all, remove all or keep/remove individual daily lesson blocks. At this time you cannot copy and paste between students, I am hoping this feature is one that gets added soon because in our case there are a lot of things both children do together. 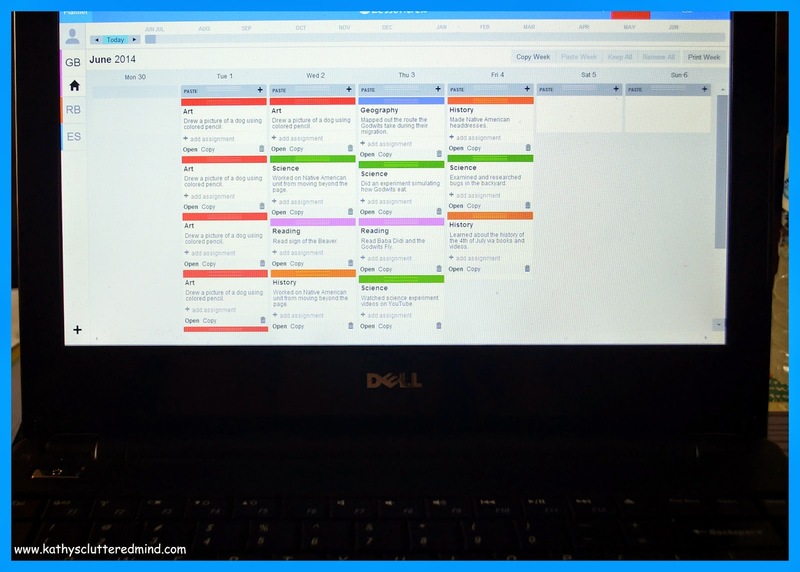 Navigating between weeks and months is really easy thanks to the date timeline at the top of the planner. When you set up your student you can choose to have weekends be visible or hidden. Since we believe learning happens all the time (even on the weekends) I choose to have the weekends visible on our calendar. And there you have it! I created a simple weekly record of what the children learned for a week and it only took me a few minutes each day. It takes just minutes a day to record subjects and descriptions. It offers flexibility and can be used in a variety of ways. Users receive excellent customer service and Lessontrek listens to user feedback. It is affordable for everyone including one income homeschool families. It can easily be accessed from any computer and even most mobile devices. It worked pretty well on my Note 2, however there are a few glitches that need to be fixed to improve mobile capability. It stores and archives records for each school year, which can easily be accessed at anytime. It uses coloring coding for children and subjects. It is great for homeschool and classroom use. Sign up for a FREE 14 day trial to see for yourself how awesome Lessontrek is. Lessontrek is very affordable and costs only $6 per month or $60 a year ($12 savings). Through July 30th you can save 50% off a 1 year Lessontrek subscription. Use code:JULY50BLUE at checkout! One lucky winner will receive a 1-year membership to Lessontrek. Only the first entry is mandatory. Other entries are optional and give you extra chances. This giveaway is not affiliated with Facebook in any way. The winner will be posted on the blog and will be emailed. Winner must reply within 48 hrs with their contact information or another winner will be chosen. Prize will be emailed to the winner via Lessontrek. I was sponsored by Lessontrek to review their homeschool lesson planning tool and am excited to share my experience as well as an awesome giveaway! All opinions are mine alone. For more information please read my full disclosure page. I use paper pencil right now for recording what we do each day...would love to try this! right now I am using bits and pieces from different planners, I just can't seem to find what works best for me. I use paper and pencil right now. This would be a great improvement. Thank you for the giveaway. I use paper and planner..Thank you! I just write it in grid right now. I haven't found a planner I like better yet. I currently use the Well Planned Day planners. I use a paper planner that I customized from the internet. I still am struggling to find one I really like. 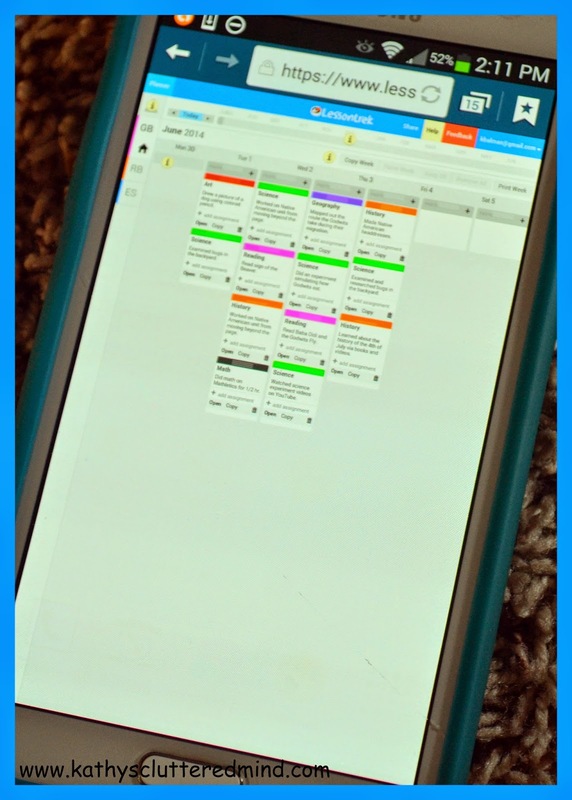 I use Homeschool tracker, but it isn't always the easiest.